Last month (January 2017) the network of EuroDairy visited some farms to get a better notion of innovative farming in England, one of them was Millers Court Farm from Ed Newton and his family. 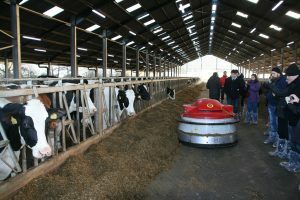 This dairy farm is a recently expanded herd in a brand new housing system and milking parlour. The 490 Holstein cows are indoors all year round on a ‘green bedding’ days and milked three times day. The herd is year round calving and average production is yielding 11.000 l per cow per year. The intention is for further grow to 530 cows. Dry matter intake is stimulated by pushing the feed up to 6-8 times a day and feeding 5% over so cows a never run out of feed. The faming system is simple with no young stock rearing on the farm. Heifers are bought after calving, tb-free, from Europe. All cows are inseminated with beef breeds (British blue). Replacement rate is 25%. Feeding is grass silage, maize silage and about 50% of the ration exists of concentrates. Grass silage is form Italian ray grass with five cuts a year. The crop rotation is 4-5 years grass followed by 2-3 years with maize. Much of the maize is bought in and slurry is exported to arable farms. After six months with green bedding there were severe problems with mastitis, therefor the bedding has recently changed to ‘sand bedding’. First results seems to be good. The EuroDairy network is searching for the latest insights and newest solutions on this matter (also see our online forum)!